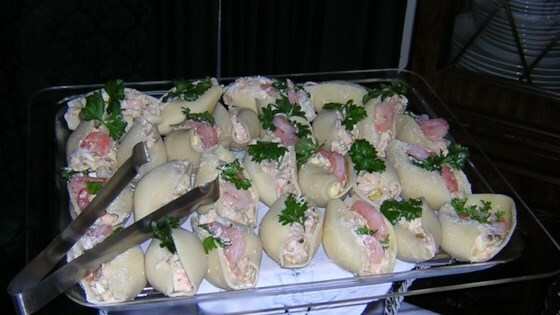 "Shell macaroni are stuffed with a creamy tuna mixture in this easy to prepare, fun to eat appetizer. Serve on a bed of lettuce leaves with toothpicks, and make sure plenty of cocktail sauce is available! Be prepared with additional 'shrimp' ready to fill the serving dish as your guests make this great appetizer disappear quickly. I keep extras in the fridge. Enjoy!" Bring a large pot of lightly salted water to a boil. Add shell macaroni and cook for 8 to 10 minutes or until al dente; drain and rinse with cool water. In a medium bowl, mix together the tuna, celery, green bell pepper, onion and creamy salad dressing. Stuff the shell macaroni with the tuna mixture. Wouldn't call it shrimp, but wonderfully healthy finger food !